The Dog's Raven Search Team (DogsRaven.net) has conducted almost 200 searches. Last year, Ebbey and Mikella were called out on thirty three searches in Montana and the surrounding states. Twelve of those efforts resulted in successful finds. This unusually high rate of success can be attributed to the team's eight years of experience together, their life long knowledge of the area and Ebbey's ability to both track and air scent. Three of these finds involved search efforts lasting over 24 hours. Anyone Can Become Lost...It Could Even Be You. The Name Dog's Raven: Even as a young girl, Mikella was a natural born tracker. Her aboriginal stepfather's father named her Dog's Raven because she could help her dog find anyone. Like when a raven helps wolves find prey. Searching with her canine partner Ebbey, Mikella uses the name Dog's Raven Search Team in her grandfather's honor. Mikella & Ebbey volunteer for the Humane Society of the United States (HSUS) and support their efforts to Stop Puppy Mills (stoppuppymills.com). My grandfather named me Dog's Raven because I could help the dog find anyone. 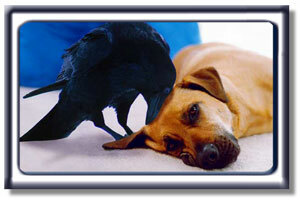 Including the family�s pet raven. I use the name, to honor my grandfather's memory. Search Dog's Raven TV Show: The Real Life Animated Adventures of a Wilderness Search Dog Team.